Nose: Wild flowers, quite noble, lots of oak spices. Palate: starts smooth and sweet like thinned maple syrup but that turns woody, green and piney but all these are not overdone. Finish: Unlike the start on palate, the finish is dry and more bitter, orange with a little spice, maybe clove? Oh hello, that’s bitter orange marmalade. Most reviews I’ve read define chocolate all over, but I don’t get much, or is it that bitter chocolate that is described? I get the bitterness. With a few drops of water I found some pepper in the finish, which helps to bring out the differences between sweet and spicy and lower the strength a little. I do like this whisky, it’s primo and I enjoyed it, so don’t get me wrong (starting a new topic here) but I think I prefer purely ex-sherry/port cask whisky rather than a mix of bourbon and sherry, or pure bourbon casks. On researching some more, it’s interesting to know that this whisky is triple matured in a trio of Spanish oak ex-sherry wine casks, American oak ex-Sherry casks, and American oak ex-bourbon casks, all matured separately for 15 years, then married. So, even having two sherry casks and only one bourbon in the dram, why is it that I’m missing the “winey” flavours then? I need to research more on the different outcomes from using sherry casks vs. bourbon casks vs. both. @murrayaitken I missed your Macau recommendation by 14 months. Oh well, I tasted some amazing grape spirit in Xinjiang last summer. As for Amrut, I'm h inking about a single cask that was exclusive to LCBO but they do seem to have a lot of them around the world. I would recommend a cask strength 2007 edition if you can find one but the others are nice too, or a bourbon single cask if you can get one. If you like Sherry a single cask or Intermediate Sherry are good bets. If you like Port, Portonova. I had a few bottles of 15 FO a few years ago, before Macallan prices went nuts. I think it was around $55 at the time, so a decent price for a good scotch. I'll never buy it again at the current $115 price. I can get Arran 14 for $65 and Compass Box Oak Cross for $42, so why pay the Macallan prices. Also, they dropped the CS, easily their best value scotch, so they can bite me! Apparently the Fine Oak series got mixed reviews when it came out. In comparison with the Sherry Oak series, the Fine Oak series uses a mix of bourbon and sherry casks. While Macallan appears to have discontinued the age-statement varieties, and the Sherry series is long gone where I live, New Brunswick is still swimming in Fine Oak bottles, which maybe says a lot right there. I believe this Scotch is naturally colored and, coming in below 46% ABV, chill-filtered. On the nose the influence of both casks is apparent. Citrus and spice and everything nice. An intense nose for its strength, sweet, with honey and sherry, citrus and even a kind of chocolatey quality. Also comes in sweet on the tongue, a familiar honey taste. Smooth and eminently drinkable, which I believe was my comment on the 12-Year Sherry as well. I found the finish deeper than what I typically get from a younger spirit, which I guess isn't a surprise. It's quite approachable and I had no problem finishing the bottle. I did find, particularly when comparing side by side with other whiskies, that the sweetness sometimes seemed a bit weirdly harsh or off. And I also found it a bit ordinary on the tongue for something in its price range ($150 in Canada). I do think this profile is useful for getting someone into single malts, as it balances having personality with staying relatively middle-of-the-road, but I also suspect there are cheaper ways to get that done. Prices will only go up with the discontinuation; I would stay away unless already a big fan. I had a couple of bottles of this a couple of years ago and really enjoyed it (87 in my book), but prices went crazy and I now pass by the section with Macallan and Highland Park. Too many cheaper whiskies that are as good or near enough. I can afford them but choose to not support their greed. Nose (Undiluted): Wood (freshly-cut Cherry crossed with White Oak) and Licorice. Palate (Undiluted): Lots of wood, very light spice. Finish (Undiluted): Medium finish with lingering light oak. Despite the feeling of being in a lumber mill chewing on a 2 by 4, this is definitely one of my favorite relaxing single malts. It's mellow and somehow the taste just works. I just could not bring myself to water this down and before I could work up the courage the bottle was gone. Perhaps next time. I've been on a recent quest of collecting Macallans ever since I met (and interviewed) their highly likable whisky maker Bob Dalgarno. And the real reason I truly appreciate the Fine Oak series is because I know first-hand what goes into creating these exceptional whiskies. The Macallan nose is what Speyside is built on and this 15 year old stays true to that. First a bowl of white melon and vanilla pods drizzled with a lovely golden syrup. Then a delicate garnish of lavender petals with a touch of clove. Finally a sprinkle of soft chopped nuts. The palate continues it's journey of sweet honey but this time with a touch of lemon, barley and cloves. However, the white pepper is a smidge too strong for my liking. The finish is strong and dry with a nice clove after taste. I’ve tried the 12yo Fine Oak before after a nice restaurant dinner and based on that I bought this 15yo which, based on reviews, has been the more popular and praised one. I really liked the 12yo already, and I have to say this older bottling didn’t let me down. The nose starts with plenty of fruit. With triple cask maturation (2 sherry casks and 1 bourbon), the sherry maturation definitely has the edge. Maybe the bourbon cask has a notable influence also, I’m thinking apricot and peach jam seasoned with vanilla. Oranges as well. There’s also some tanninic oakiness in this very promising nose. Nice indeed! The palate continues where the nose ends. Rich and sweet fruitiness with some oak and spices. Extremely smooth and well balanced, coats the mouth with the ripe fruit flavors. This one opens slightly with just a small drop of water, but doesn’t need much of it. Very satisfying all in all. The finish is long and lingering, perhaps even the best part of this dram. The sweet fruitiness slowly fades away and gives room for the oak and malty notes. This combination in the finish is extremely mouthwatering and really tops off this wonderful whisky. I really like this, and can strongly recommend it. Why not then give a 90+ score? Well, I guess it could use still a bit more complexity and a surprise element to get there, but worth every penny still. taste (water) more rounded mouthfeel, no longer oily. Pepper and the citrus notes promised by the nose emerge. Long dry white wine finish. The few times I have had this have all been at a nice local restaurant in my parent's town. We go there occassionally, and we recently went there to celebrate nothing other than the joy of life, and to spend some time together. Nose: This is a 'full' nose if that can be said. I certainly get vanilla, and a bunch of oak. There is some spice on the nose too, perhaps cinammon. It is so well rounded I could sit here for a long time and just nose it. Palate: The show continues with a buttery honey taste, maybe toffee. Just enough oak to let you know it is there, and a lingering sweetness...chocolate, dark chocolate. Finish: Spicy with some fruits. More chocolate...smooth, sweet and long. Again, I have to reiterate the environment theory I have...scotch tastes different in different locations. Sure there are obvious factors, like scents from a kitchen, smoking cigars, or simply being in a peaceful locale without distraction, but for whatever reason, I love scotch in restaurants. Not as much as on my own terms, but I do dig it in a hearty, wood filled arena. 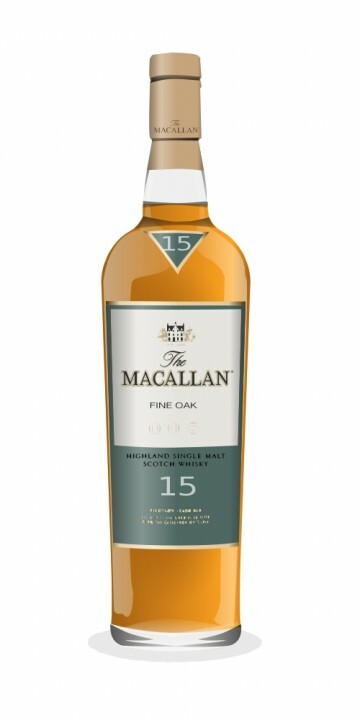 The Macallan 15 Fine Oak takes the classic Macallan-sherry flavor and punches it up a bit with the Oak. I'd certainly keep a Macallan in my cabinet, and this one is high on the list. Certainly one of my favorites of the 'Fine Oak' range. What follows sounds much lamer than it actually was. Omar, Fab and I - three very close friends for the last 20 years - decided to have a weekend away. Originally it was to be Vegas...but with Omar 3 months closer to being a dad (and living in Montreal), and Fab being, well, Fab...we had to stay closer to home. So we met between Toronto and Montreal in...Kingston. It was a blast - Cambodian food, weird stoned strippers, lost walks in the snow, loud snoring, and other bits of mendacity - but more importantly, I brought two bottles to share with the boys. This was the first we poured. When the Macallan launched its Fine Oak range a few years ago, it was to shake up their traditional offering of purely sherried malts (I am sure however that the rising prices of sherry casks had something to do with this as well). The Fine Oak range uses three types of casks: European sherry oak, American sherry oak (seasoned with sherry in Spain) and American bourbon oak. There are eight bottlings, ranging in age from 10 to 30 years old. The 15 Year Old is generally considered to be the most celebrated of the generally available bottlings. The colour is a light pale straw. The nose is a little tight but lovely: honey, mango, some nuts (Almonds? Hazelnuts? ), orange, hints of vanilla and some lashings of mint. More subtle than you might imagine, but fairly complex. Definitely brings out the nature of the spirit, especially with a drop of water, which brings out more malt and herbs. The longer it sits in the glass, the more it develops, getting spicier and showing more evidence of the sherry casks. The palate has a little bit more spice (cinnamon, nutmeg), more honey and vanilla, and more tannic sherry notes. Such a delicate, luxurious mouthfeel! The profiles here are similar to the nose but much more vibrant - again, water opens this up in a beautiful way, and time in the glass both softens and spices it up. Delicious! I love Macallan 12. Love it. Goes so well neat, with a splash or on the rocks. My everyday go-to if im at a bar or restaurant. Picked up a bottle of the 15 last week and wasn't feeling it. Mind you, it's a great Scotch, but not as smooth as the 12. I expected it to be even more amazing than the 12 but didn't find it that way. My guess is the Oak vs Sherry cask makes the big difference. Not worth twice the price in my opinion. Yes, I prefer the sherry cask Macs over the Fine Oaks. More succulent and candy-coated goodness. But then again, when it comes to the Macs, I have a "sweet tooth." Nose: On first whiff the odor of alcohol is overwhelming, like sniffing astringent. Let it breath a little, and the nose opens up quite a bit. The scent of alcohol gradually gives way to a perfume that separates into pine, citrus, walnuts, and especially caramel. Palate: Ah, here's the oak. Very woody with a pinch of pepper. But also chocolate covered bananas drizzled in caramel. Adding a few drops of water really brings out the contrast between the sweet and spicy. Finish: Salted plantain chips and herbal tea. Menthol steaming up the throat. Long, warm, and satisfying. Dark chocolate and mint linger on the tongue for minutes. I really didn't care for this bottle on my first try. The bite of the alcohol in the nostrils just really overwhelmed everything else this whiskey had to offer. I tasted bitter oak and little else. Revisiting it now, letting it breath for a few minutes was definitely key. A lot of conflicting sensations throughout, yet they somehow work together to offer a very fulfilling experience. I'm glad I gave this one time to work its magic. The finish is probably my favorite part. I see you haven't rated the 12 sherry cask mac. Me, I've never tried the fine oaks. I should go there. My hesitation has always stemmed from the suspicion that I might find the Mac fine oaks to be too bitter. Bitter oak doesn't appeal to me. For instance, I found the Glenmorangie Astar to be too bitter for my liking. Well, it's 1:16 and I should have retired to bed an hour ago. Thanks for the review, fish. I'm now going to try the fine oak 15 if I can find it, or at least the 12. You've convinced me. I found it bitter at first myself. In fact, I immediately regretted buying it on first try. It was tasting a lot of other Scotches and expanding my palate that helped me give this one another shot and appreciate what it had to offer. I want to try the 10 year. I hear it ranks up there with the 15 but much cheaper. Nose: Fresh, wet grass, drizzle, morning dew, rose, pine, walnuts, orange peel, bitter chocolate, maple syrup, blue berries, honey, caramel. Palate: A sweet presentation right away like a nectar or rose water. Fades into slight smoke, very peppery initially but, mellows out. Tastes green, like a pine, I taste the sap, the needles, and the bark. Slightly minty. Finish: creamy, milky, again the flavor of some type of plant or herb. Very woody. Then goes into a green tea aftertaste. Overall its a medium to slightly heavy bodied dram. It's no bruiser but, it's not a light dram either. At times it can be heavy on the palate due to it being viscous but when it goes down the hatchet it's light. It's good but, not anywhere north of $60 good. This past Christmas I received the Macallan 12, 15, and 18, all in the Fine Oak range, from a very generous friend. The notes of each were taken in direct comparison of one another in one sitting. The differences between the 12 year old and the 15 year old were the most striking of the three (the 15 and 18 being somewhat similar). Nose: Rich caramel and maple syrup. Oranges. This is a nose of quality. Just nosing this one is satisfying. Palate: Sweet oak, lemon zest, floral nature returns. Well rounded and easy going. Finish: Very similar to the 12 year old unfortunately, however, it is a bit more flavorful with more oak influence. The nose is the star of this whisky in my view. Unfortunately, the nose and the taste aren't too close. Where the the nose is rich and flavorful, the taste is somewhat indistinct. Much better than the 12 year old, however, had the taste been a bit more forward, this whisky would be one to savor. This is a wonderful drinking scotch. Starts a little spicy then mid-palate has a great chocolaty, caramel with a long lingering finish. It is wonderful! @ironlion27 I've got to admire you for your strong convictions! First 0.5/10 for Ardbeg 10 yr old and now 10/10 for this. I guess you love it or you hate it! In the Fine Oak Series there is a 10 Year Old, 12 Year Old (see my previous reviews), 15 Year Old, 21 Year Old and even a 30 Year Old. Unfortunately I have not yet tasted the 21 and 30 Year Old. I recently had the 10 Year Old and the 12 Year Old. Now let us compare this to this 15 Year Old Fine Oak. This 15 Year Old differs quite a bit from his younger versions and has a nose with chocolate, cinnamon, roses and raisins. Quite complex! On the palate that will be deliciously coated with this dram, the chocolate returns but is bested by the raisins and and touches of oranges. Thanks to the higher ABV of 43%, this dram is much better indeed. The finish wasn't spicy and long enough for me. I longed for more. When you consider that this 15 Year Old is about 60 EUR a bottle, then I believe the 12 Year Old is still your best buy. Because this bottle's price is 50% higher than the 12 Year Old, but this difference is not reflected (I think) in the quality which I feel is closer to 10%. Mark - I have learned to trust certain reviewers - you are one. I came down about this point for the Mac15. As long as I keep my expectations in light, I am typically quite happy. The only issue is the price - I pay $70US + hideous WA tax. At $50 - this would be a great deal. Ahhhhh there is also the hidden gem; The Macallan 17. Lots more citrus notes to the palate with a finish longer than the 15. Delicious. Try it as well as the 21. You'll love them both.